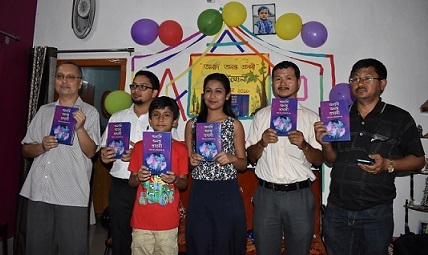 ‘Anadi Ananta Prashari’ – a collection of science-based articles in Assamese, authored by husband-wife duo Pranabjyoti Das and Archana Das – was released during a ceremony at their residence in Tangla of Udalguri district on Friday evening. The book, which has been published by Purbayon Publications, Guwahati, was jointly released by Assistant Professor of the Department of English, Tangla College, Narayan Gahatraj and former Research Fellow at Fremantle, Singapore International, Shimanta Bhattacharjya. “The book is a compilation of science-based articles which will go way long in removing superstitions from the society and build a scientific temperament among readers by popularizing and fascinating the younger and older generations towards science,” said journalist Shajid Khan on the occasion. While Archana Das is an Assistant Professor of the Department of Zoology, Tangla College, Pranabjyoti Das, who previously served as an Assistant Professor in the Department of Zoology, Tangla College from 1995-2012 is currently the principal of Arunodoi Junior Science College, Tangla. The programme was also attended by lecturer in the Department of English, North Darrang College, Tangla, LK Ramchiary; principal of Arunodoi Academy, Nepoleon Daimari among others.